An outbreak of toxic algae has been found at a popular beauty spot in Cardiff. 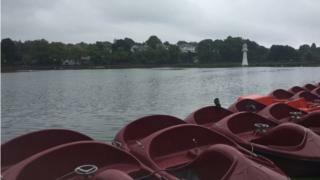 Natural Resources Wales (NRW) has confirmed the presence of blue-green algae in the water at Roath Park Lake following warm weather. All boats and pedalos have been stopped on the water, which has been closed due to the "infection". NRW said the algae was "toxic and can cause illness in humans and even death in animals". Cardiff council is warning people to stay away from the water and keep dogs on their leads. The authority confirmed the boat stage had been closed after one of its park rangers spotted the algae. It was unable to say when the lake would reopen for leisure activities, but the water was being regularly tested and the lake will reopen when levels return to normal. Susan Fitzpatrick from NRW said: "We advise people to take caution with themselves and their pets when near a water body with blue-green algae and to report any sightings." The environment body said it could be a number of weeks before the "bloom" ended.